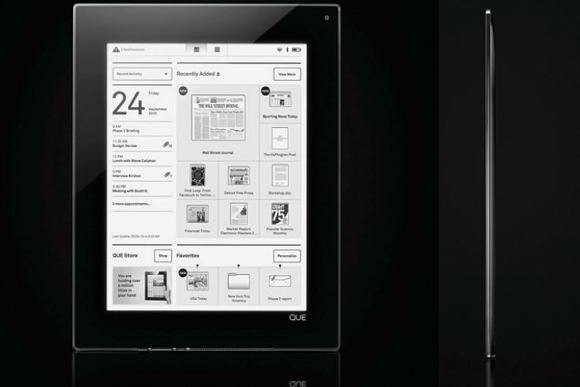 Everything you need to know about the pile of e-readers that debuted at CES. The Kindle is looking almost lost now among the flurry of new e-book reading devices just released or due soon. So many are out, in fact, that 2010 is really the year of the e-reader. But only 2010. Because e-readers are doomed. Plastic Logic’s Que e-reader has been long anticipated thanks to its clever flexible screen (the “plastic logic” bit) and elegant design in a market that’s often the venue for some very ugly gizmos. When it launched last week it delivered on both those fronts, and surprised on a totally new one: The e-reader device is due soon, but it’s been re-directed so it’s going to appeal almost exclusively for business users. Rich ones, that is. It costs $800. The idea has some merit since the Que can act as a powerful business tool that draws together lots of live data like email, stored data like business document or project archives, and it’ll even let you edit the content to a limited extent. Hard to say how well it’ll sell though–though it’s undeniably neat, it’s high price almost makes it a curio that’ll only have a tiny market. Many professionals would probably spend a little more, and get a new thin-and-light fully functional laptop. The Skiff has the benefit of being almost as cleanly designed as the Que, and it’s also astonishingly thin–making the Kindle seem a real low-tech porker in comparison. When it debuted at CES lots of attention was thus devoted to its design and the gorgeousness of its vast high-res 11-inch screen. 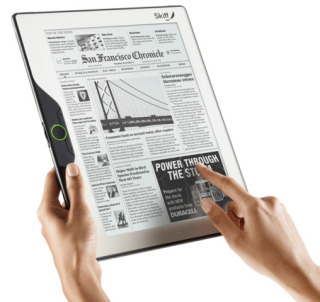 But the Skiff’s real secret is its software that makes it an almost ideal e-reader for magazine or newsprint content. It’s capable of rendering faithful grayscale versions of printed content in such high resolution it’s almost like a photocopy, and its clever dynamic advertising engine could transform the way ad placements are embedded into publications. Fiscal backing by Hearst is behind all this, of course, and if anyone has the energy to push the technology forward in this direction, that’s the company to try. Controversy is chasing the tail of the Spring Design Alex, but it’s undeniably a damn clever machine–part android smartphone (without the phone part) and part e-reader. That combination of color LCD and larger e-ink screen makes the Alex a long battery-life multipurpose device. This gives it big potential to be a disruptive influence in the e-reader biz: It can run Android apps where its design-clone Nook rival cant, and it can act as a plain e-reader that also lets you listen to MP3s (via a sweet interface that makes Amazon’s look stone aged). The new deal with Borders is definitely going to make the device one that the public gets to see the most. This is the oddest e-reader to be shown at CES, though we’ve heard of it on and off since last year. 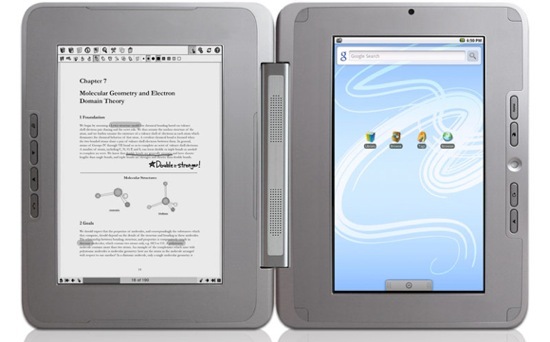 It’s a book-format dual screen device, with one e-reading e-ink screen and one LCD screen for a touchscreen netbook–earning it the label “Dualbook” from Entourage. At CES we learned it’s due to ship in February and it’ll cost around $500, which places it at the upper end of the e-reader price market, and the netbook market too, though it’ll have the benefits of a bit of both machine. But this split personality might be the eDGe’s downfall: It results in an ugly device that has two different-sized screens and an uncertain product category–is it an e-reader, or a computer? Will users want this sort of half-and-half solution, and no particular big-name publisher backing? The Amazon Kindle: What next? Amazon just updated the Kindle DX into an international edition (continuing its badly cocked-up efforts at a global product) but though that’s the only sign of a change in the Kindle lineup for ages, you can be sure a new Kindle’s on the way. When? Nobody knows. What new tech will it have in it? Nobody knows. What is for certain is that Amazon really needs to step up to the mark with the next Kindle–the e-reader marketplace is no longer empty, and there’s plenty of hot competition. The Kindle’s design and functionality needs to drastically improve, and Amazon needs to look at open book formats. Else the Kindle will lose its coveted top spot really fast. 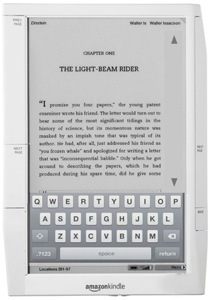 With all these new e-readers on the market, calling 2010 the year of the e-reader makes perfect sense. It’s an event that’s been long foretold–though we won’t be seeing the demise of the physical book anytime soon. But I’m going to argue that 2010 is the first and last year of the e-reader. Because they’ll look awkward and clunky in 2011, and though they’ll survive as a tech genre it’ll be as useful if niche products. You see 2010 is also the year of the Tablet PC. 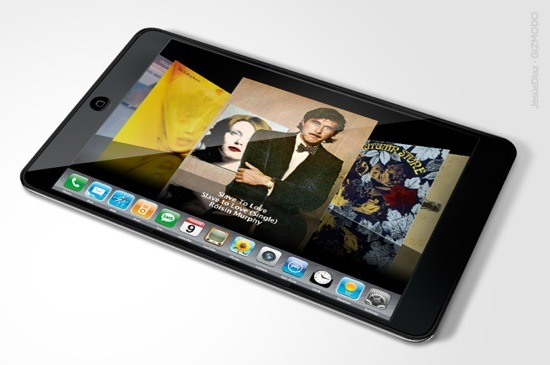 Or Slate PC or whatever you want to call it–a device that has much of the same form-factor as an e-reader, and which can do all the same clever e-book reading. And an infinite amount more. And before you go harping on about long battery life and the benefits of e-ink for reading, then slates (if they take tech cues from netbooks, which they will) will have battery life that’s just about long enough, and screens that are good enough for reading from–even before considering pixelQI tech. And that’s going to seal the deal for millions of consumers. E-books, movies, full Web surfing, emailing, Skype phoning, gaming–all on a slate, with the benefits of multitouch screen and motion-sensing controls. Why buy two devices? Best of all, I made it all the way to the end before even writing the words Apple Tablet or global iSlate. Those words are almost enough by themselves to signify it’s game over for the e-reader.